Gold Instrument Cable with Neutrik Silent Plug gives users the ability to hot-swap instruments without that earsplitting pop. In addition, this high clarity cable has a high density shield and the finest quality 1/4" connectors, and if you're the kind of player who moves around a lot, carbon impregnated PVC provides an anti-static shield layer to prevent all handling noise. 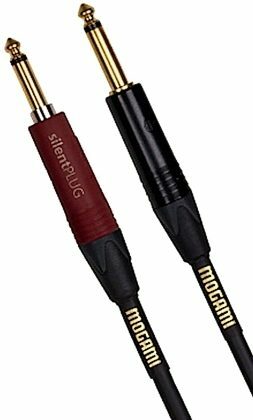 "Love the Silent Plug and overall high qualty"
Overall: Mogami simply makes the best cables in the business. This cable is my new favorite. First time I've used the Silent Plug and it makes a world of difference.